After surviving a near-fatal motorbike accident, Juma Mape has reason to believe luck is on his side. But his biggest lucky break was in 2010, when he started working with Winrock International through the USAID-funded Integrated Water, Sanitation and Hygiene (iWASH) Program. Through iWASH, Juma was transformed from a part-time worker in a dead-end job, to a successful businessman who is helping Tanzania develop its valuable water resources. In 1998, Juma was a promising student without enough money to complete high school. He put his academic career on hold and took a job as an apprentice well driller. For years he worked from one drilling job to another without a fixed monthly income. 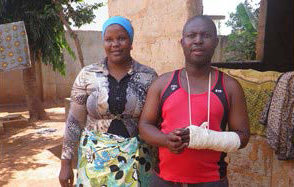 Then, after 12 years, the iWASH Program offered Juma the break he needed. Using a private-sector approach, the iWASH team helped Juma and other local drillers develop the skills they needed to start their own businesses. “From the outset, iWASH informed us that they would like to work with us directly as private sector operators, rather than through other companies. I felt liberated; excited by the idea of managing my own affairs, instead of being someone else’s employee,” Juma explains. technical drilling skills and added appreciable value to my professional life,” Juma says. In 2011, only 12 months after starting work with Winrock, Juma purchased new equipment worth 800,000 Tsh (US$500), enabling him to grow his business and manage more than one contract at a time. To help Juma and his fellow drillers develop sustainable businesses, Winrock provides business training. Each enterprise was encouraged to expand their clientele. Through the Program, the drillers and pump manufacturers developed marketing materials and networks to publicize their services and products. “From the beginning, we knew that one day the Program would come to an end and that it was up to us to prepare ourselves,” Juma says. The demand for manual drilling continues to grow. Since 2011, Juma’s company has drilled 106 wells, including 31 for the iWash Program and 75 purchased privately. To handle the increased demand, Juma expanded his operation by establishing and personally training two teams of four drillers. Quality workmanship and success in building his own teams has made Juma a sought-after trainer throughout Tanzania. “The project publicity brochures and the different trainings I have conducted for other iWASH partners have made me well known in other regions of Tanzania. Working outside my home area has enabled me to meet and learn from so many different people, with a wide range of knowledge, skills and experience,” explains Juma. 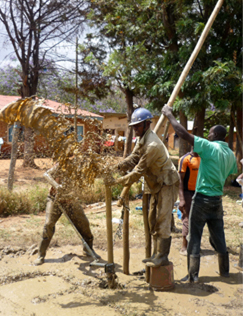 A Rota sludge team drilling a school borehole in Morogoro. Rather than fearing business competition, he sees the bigger picture. “As you train other people, the technology grows and gets disseminated in a wider spectrum with more potential for the community to benefit. The more people demand water, the more work there is for us,” Juma says. Summing up the impact of his partnership with Winrock, Juma distinguishes two key benefits– professionalization and sustainable income. He estimates that drilling and rope pump installation now provides about 40 percent of his net monthly incomeaveraging about 600,000 Tsh ($375) per month in net profit. Juma has used this additional income to make strategic investments for his family and his business. He purchased land, built a house, invested in his own borehole and rope pump, and paid school fees for his children. For his business, he purchased two motorcycles, a laptop computer, a digital camera, and a mobile phone. Besides responding to demands for his services, Juma started bidding on government tenders advertised in the national press, and he plans to purchase equipment to enable work in all drilling conditions. He is also diversifying his income-generating activities into lucrative operations, such as maize milling and trading.